the low 4935 on last friday (20th Nov 2009). Now we could able to see how market dynamically responds to GANN FAN lines. Simply to say Supports near 4800(increases with respect to time) & Resistance near 4950(increases with respect to time). And Now the Ideal strategy is cover your shorts if Nifty breaks above 4950. or Hold the shorts with a minor acceptable stop loss above 4950 for targets 4820 . If weakness is expected on monday then one should book profits near 4800 levels as long term GANN FAN supports are expected near 4800 zone. 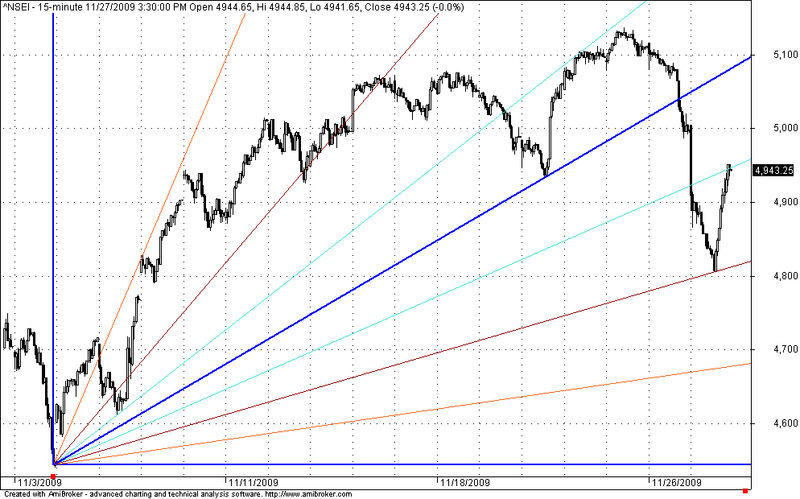 The next trade should shorting Nifty only if Nifty breaks below 4800 levels for a target of 4680-4700 zone..